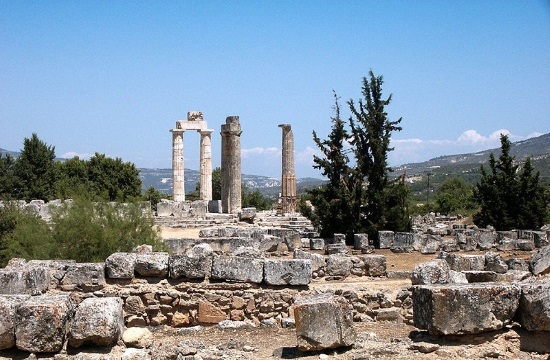 ANCIENT NEMEA, GREECE – Stephen Miller, the renowned American classical Archaeologist from the University of California at Berkeley and the architect of the revival of the Nemean Games on antiquity, is already preparing for next year’s event from his base on the Peloponnesian Peninsula. The front covers of the brochures for the seventh, and next, Nemean Games scheduled for June 26-28, 2020, feature the infant Opheltes, whose death was the cause of the creation of the original Games – one of the four Panhellenic Games of Ancient Greece that were first held in the 6th century BCE. According to tradition, Opheltes was set down on a bed of wild celery when a deadly snake bit him. Hence, the crown of victory at Nemea was made of wild celery. “All the games in antiquity had to do with death. They were really an expression of life in the face of death. If you go all the way back to the Funeral Games of Patroklus in the Iliad, we’re going to run and jump and show that we’re alive even though Patroklus, Opheltes are dead,” Miller told New Europe during an interview at the offices of the Society for the Revival of the Nemean Games (http://nemeangames.org/) in the village of Nemea. The Seventh Nemead will take place on June 26-28, 2020. It was at Nemea that the Ancient Greeks celebrated athletic and religious festivals that were part of the cycle of games at Delphi, Isthmia, and Olympia. The ancient stadium that Miller discovered at Nemea in 1974 is an important monument in the history of classical sport. Unlike in the Olympics, the Nemean Games gives the average person a chance to participate in an international athletic festival where athletes run barefoot on the same soil where their ancient counterparts ran more than 2,000 years ago.